Most historic metal bridges dating to before 1970 made use of rivets in some manner. Rivets were nearly always used to fasten together built-up structural steel on bridges. Rivets were also frequently used for the connections that hold the parts of metal bridges together. Today, rivets are not used in the construction of new bridges. Instead, welds and high strength bolts provide the function of rivets in bridge construction today. However, when restoring a historic bridge, it is important to maintain the original design of the bridge, and as a result riveting still has a place today in the field of historic preservation. Yet often rehabilitation projects that address rivets requiring removal make the choice of replacing them with modern high strength bolts. Choosing to do so eliminates an important aspect of the historic bridge’s design, craftsmanship, and even visual appearance. Because they are not used today on new bridges, making sure that historic bridges retain their use of rivets is the only way to ensure that this important aspect of bridge fabrication that lasted for over a century is not lost forever. Additionally, rivets have a much more visually pleasing appearance as opposed to bolts. Most rivets on bridges have a button head design which is found on each end of a driven rivet. By virtue of both their shape and symmetry, they give the bridge a much cleaner and pleasing appearance than bolts, regardless of what angle the bridge is viewed from. At the same time, the rivets, which are often present on the iron/steel of a bridge in great quality, actually give the steel of the bridge a pleasing sense of depth and texture. Rivets are also both strong and safe. 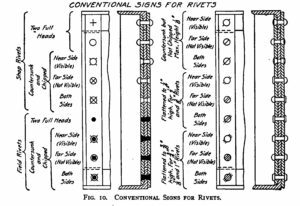 The simple fact that riveted bridges from the 1870s and earlier survive today, even with many of their original rivets, is testimony to durability and safety of rivets. New rivets and the tools needed to drive them remain available today. Bach Steel is proud to specialize in riveting, and we look forward for an opportunity to make use of our riveting skills to restore your bridge. Bach Steel can perform riveting, typically of higher quality and lesser cost than the few other firms in existence that may be trained to do riveting. This is because, unlike some firms, Bach Steel does not believe in charging a premium for riveting. We price our rivet work at a fair rate that corresponds to the actual materials and labor involved… a price that is usually competitive with the cost of using high strength tension control bolts that require a time-consuming “turn of the nut” procedure. Please don’t be discouraged if another firm has quoted a sky-high price for a riveting project! Instead, contact Bach Steel and we can likely do the work for less! Below are some resources about riveting that we hope you will find useful. Click here to view an interesting historical article about rivets and riveting from an early 20th Century Maintenance of Way Cylopedia. 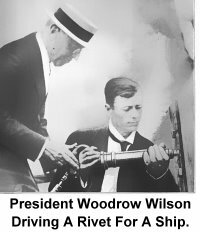 Additionally, click here to view an excerpt from another early 20th Century book that describes in detail the best practices for riveting, as well as some benefits of riveting, and the risks of hiring someone who lacks proper riveting experience. Click on the below image for enlargement. 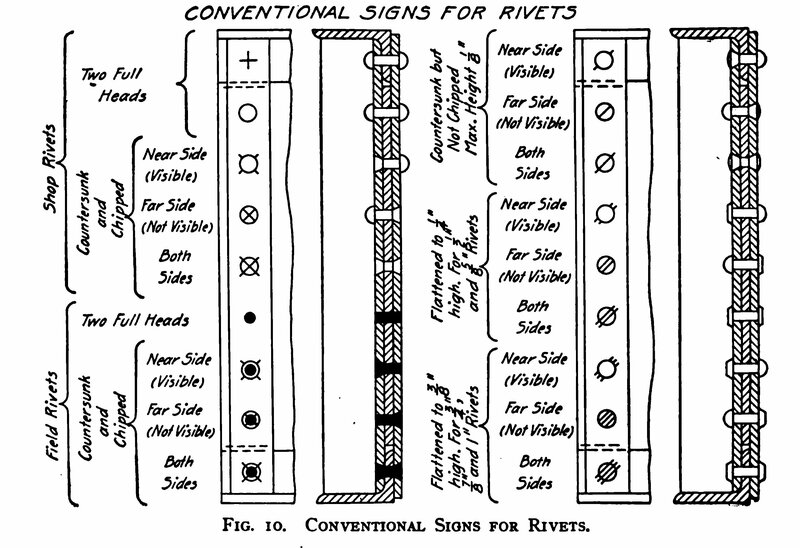 This diagram explains the different symbols used to represent rivets on bridge plans and drawings. Source: Ketchum, Milo Smith. 1918. Structural Engineers’ Handbook Data For the Design and Construction of Steel Bridges and Buildings. Writing specifications for riveting into a contract proposal is a good way to make sure rivets are used (and used properly) when a historic metal bridge is restored. Click here to view a special provision that includes riveting as part of a bridge restoration. The bridge was the Pipe Creek Road over Pipe Creek in Franklin County, Indiana which was restored for continued vehicular use on a county road. Of particular note is the below paragraph from the special provisions that mandates the use of rivets and specifies the quality of the workmanship. Any rivets missing or removed from the existing bridge and that are to be part of the restored structure shall be replaced with new rivets. New rivets shall match the size and location of the existing. The rivet steel used in the restored structure and handrail shall have a minimum yield strength of 36 ksi and shall bend cold through 180 degrees flat on itself without cracking on the outside of the bent portion. 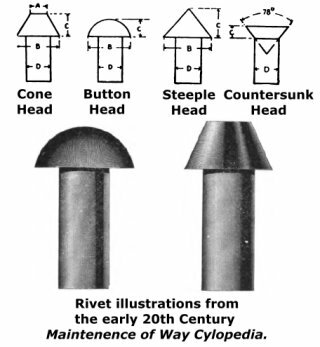 The rivet head shall flatten, while hot, to a diameter 2 ½ times the diameter of the shank without cracking at the edges. The rivets shall be true to form, concentric, and should be made in a workmanlike manner. The restoration of the State Street Bridge in Bridgeport Michigan for pedestrian use serves as another example where riveting was written into a contract proposal ensuring this important aspect of a historic truss bridge restoration was completed properly. Click here to view the full contract proposal. Click here to view photos of the Bridgeport Bridge. 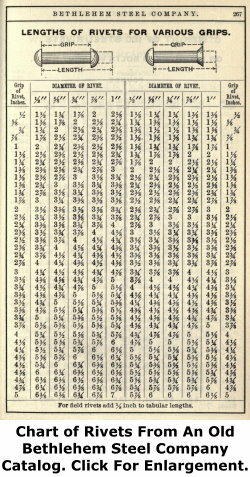 The language for riveting was much more detailed for this project. The relevant language from the contract proposal is below. Rivet Type and Material. Rivets shall be new, hot-driven round button head. All rivets shall conform to the material requirements of ASTM A 502. All rivets shall conform to the dimensional requirements of ANSI Standard B18.1.2. Rivets shall be approximately hemispherical in shape and shall be of uniform size throughout the bridge for the same rivets. Preparation. Before members are riveted together all chips, burrs and foreign material resulting from drilling, punching or corrosion shall be removed from the surfaces to be joined. If burrs are removed by chamfering, the depth shall not exceed 1/32 inch. Members to be riveted together shall be temporarily pinned or bolted and rigidly clamped together while riveting. Drifting of parts during assembly shall not distort or enlarge the holes. The Contractor shall determine the number and pattern of temporary pins or bolts necessary to bring surfaces into adequate contact for riveting. Such pattern shall be approved by the Engineer. Temporary pins or bolts shall be successively removed as rivets are installed. Rivet grip lengths will very depending on location. The length of undriven rivets shall be sized to provide minimum head dimensions as specified in ANSI B18.1.2. (see AISC, manual of Steel Construction, Sixth Edition, 4-83 for guidance). Installation. The rivets shall be heated in an electric, gas or kerosene furnace and shall be driven within the range of 1500-1950 degrees F. The maximum heating temperature will make the rivets a light yellow in color. Avoid continual heating of rivets in furnace after they have reached driving temperature (excessive “soaking”). Direct flame impingement on the rivets shall be avoided during heating. The rivet shall then be positioned into the hole. Prior to working the rivet, the diameter, the length, temperature and fit shall be evaluated and if all is not correct, the rivet shall be rejected and corrective actions shall be taken. Any slag formed on the rivets shall be knocked clear prior to riveting. The hot rivet shall be driven into the holes. Rivets shall be driven using a Boyer fieldriveting hammer (or approved equal). The driven rivets shall be tight and in uniform contact with the surfaces of the joined members. The surfaces of angles or plates to be riveted shall not be scared from the process of driving the rivets. Workmanship. Installation of rivets shall be accomplished in a workmanlike manner. Rivet assemblies shall be of uniform quality and free from cracks, gaps, sharp edges, burrs, loose parts or other defects which might render the assemblies unsuitable for its intended purpose. Quality Control. The Contractor shall be responsible for all riveting quality control. All rivets shall be inspected immediately upon completion of driving and forming to ensure the rivet heads are seated against the plate or angle surface and are not cracked. The Contractor shall visually inspect each rivet for the conformance with ANSI standard B18.1.2. Sound each rivet to ensure it is clamped tightly in place. Loose rivets or button head dimensions out of specification shall be rejected and replaced at no additional cost. ASTM A 502 can be viewed here for free. ANSI Standard B18.1.2 can be purchased here. AISC, manual of Steel Construction, Sixth Edition can be purchased used here or new here.